SoftPlanet makes it possible for everyone to get free GS Auto Clicker download directly from our servers. There is no registration needed for downloading. GS Auto Clicker V3.1.3 is a great free tool which can be downloaded and used to help you to automate processes which you have to repeat many times in your daily work. For instance if you work with documents, play a game or use whatever program which involves excessive mouse usage you can save some of your time with this smart application. This program is absolutely free and can be used an unlimited number of times and with any computer and any Windows operating system. GS Auto Clicker can be set to use the left, the right or the middle button of your mouse. 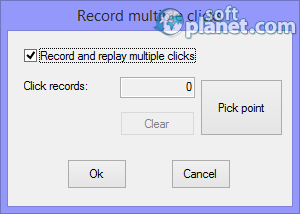 Also you can choose a single or a double-click action; you can record and replay multiple clicks; the Start/Stop hotkey can be changed based on your preference. In addition to that you can choose what will happen when the program finishes its task. The balloon tip which is displayed each time you use the automatic mouse clicker is a nice feature. Any saved action can be repeated more than once or until it is not stopped; the frequency can be set in milliseconds, seconds, minutes or hours. GS Auto Clicker has a small enough user interface to not interfere with your normal work but at the same time it has highly customizable settings and options so you can achieve your goal. Users can visit a website which has an online-based help system with very detailed instructions about how to use all the program features. 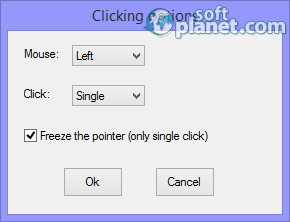 Once you choose your preferred hotkey, you can minimize GS Auto Clicker V3.1.3 and only refer to its window if you need to create a new click pattern. 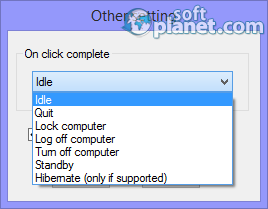 A useful feature is On Click Complete which can be set to idle or quit, or to log-off, turn-off, standby or lock your computer. GS Auto Clicker V3.1.3 is a small-sized program but it is "big" for what it can do for you. If you need to do repetitive mouse clicks and you want to save some time – this application can be your best friend. Try it and see if it is the right choice to automate your work and have some free time for something else. GS Auto Clicker is VIRUS-FREE! Our security scan shows that GS Auto Clicker is clean from viruses. The current version of GS Auto Clicker has been scanned by our system, which contains 46 different anti-virus algorithms. That ensures that GS Auto Clicker V3.1.3 is 100% safe for your computer.